Grapeseed oil is an oil that I'd see in the store but didn't know much about so I ignored it. Reading hair blogs and looking for some natural products that I can use on my relaxed hair grapeseed oil popped up a lot. A whole lot. Despite that, it took me several months before I tried it. I have to say I really like and plan to continue using it. 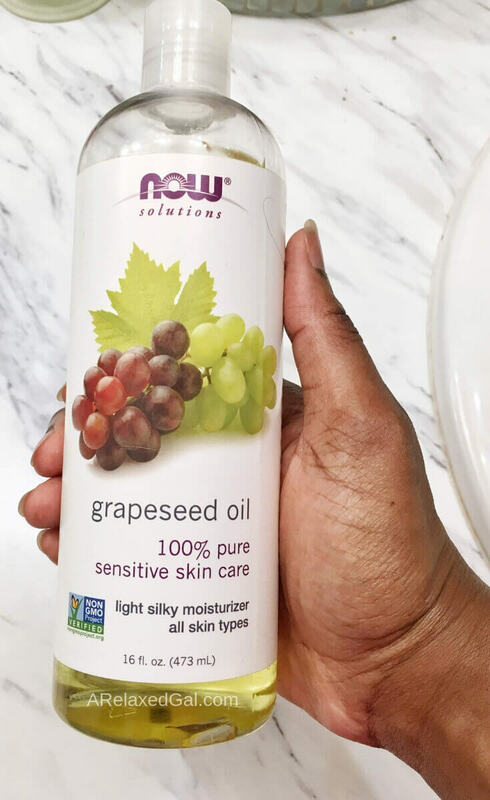 So what is grapeseed oil? As you'd expect it's an oil derived from the pressing of winemaking grape seeds. The oil itself is non-greasy, light and odorless. The best types to use are pure organic or organic cold-pressed grapeseed oil. Have you used grapeseed oil in your hair regimen? I love grape seed oil. I use it on my hair and to take off my makeup. I'm a massage therapist and i use it in my practice too. It's a great oil. Interesting. I never thought about using it on my face. Do you use another oils on your hair? Thanks for reading Ginger! Use it on my face over night & after every "wash & go" with a non-cream leave in conditioner(creme of Nature spray in\leave in conditioner)Add Grapeseed with (pure)Vtiamin E & aloe for\to your face regime.thank me later.